Bringing people together on dusty grounds and cement pavilions to hosting over 40 000 people at Orlando Stadium, the timeless tradition of soccer becomes more than a game but a way of life not only for players but for supporters too. A lone black and yellow soccer jersey hangs on the laundry line, giving an indication this is the correct address. A man walks out of the house with a smile on his face and reaches out with a firm handshake. Sipho Nkosi, ‘Mr S’, is preparing to watch a soccer match with his brother and friends the following day. “Tomorrow is a long day,” he says as he walked back into his house to collect a copy of the soccer newspaper, Soccer Laduma. “Look! There are five matches tomorrow. From half past three, I will be watching soccer. I am just getting my kit ready,” says the 31-year-old. This Friday afternoon, October 27, in Orlando East is filled with people scurrying around Rathebe Street. The sense of community is amplified by greetings from both sides of the road as the ‘gents’ salute each other with handshakes and slang greetings. “Verder?” (How are you?) is constantly repeated as you walk down from JB’s liquor store. Vegetable stalls, spaza shops and yard sales are not the only hype of the street on a Friday afternoon in the streets of Orlando. Worn with pride, soccer jerseys in all forms and colours are paraded on either side of the road. Black and white for Orlando Pirates here, Kaizer Chiefs supporters in yellow and black there, some faded and others crisply new. 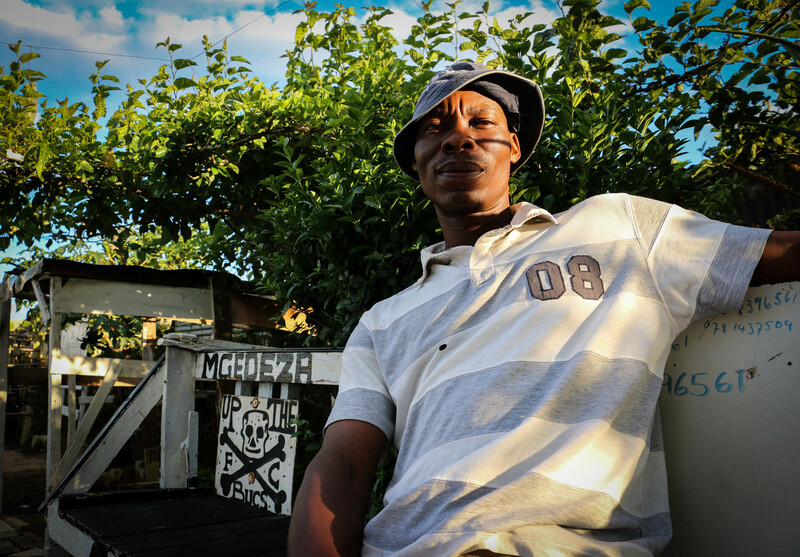 Further down the road, where Herby Mdingi and Rathebe streets intersect, on the sidewalk of house number 826 sit two men on black and white wooden benches, which have been embellished with a neatly-erected wooden structure. A few steps away from the sitting area is a table with assorted sweets and cigarettes for sale. Next to the stall is a tall white board with black writing: “Orlando Park… The Happy-Peoples, 826”, flanked on either side, by an Orlando Pirates football club skull emblem. COOLING OFF: Orlando Pirates supporter, Ace Mokoena, whiles away a Sunday afternoon in the park dedicated to his favourite football club. Orlando Park was curated by 59-year-old Lazarus Mthe in 2016, in honour of Orlando Pirates Football Club, established in Orlando in 1937. Offered a yellow vuvuzela by his brother, Ace Mokoena, who lives in the same yard, Mthe refuses to blow it saying he cannot be seen holding a Kaizer Chiefs vuvuzela. Speaking in Zulu, Mthe describes his passion for Orlando Pirates as a young boy with a smile on his face. “Ngiyithanda ngenhliziyo yami yonke, (I love it [the team] with my whole heart),” he says bringing his hands closer to his heart. Mthe describes how he fell in love with soccer in the 1960s as a hobby that he was introduced to at Orlando High School when playing with friends during break times and after school matches in the streets of his hometown. The park’s wooden structure which still needs restructuring, and another coat of paint to make it look “more attractive”, according to Mthe, is accessible not only to the community but anyone who wants to take a seat in the Orlando Pirates haven. “I made this for the people, especially for gogos who walk to and from the clinic. They can sit here and rest. People love sitting here. Pirates played at the stadium a few weeks ago and people from Vereeniging parked here and took photos and I told them it was sharp,” he says. Mthe and Mokoena not only share a passion for soccer, but support Orlando Pirates religiously as a family. House 826 in Herbi Mringa Street is a compound filled with friendly and welcoming faces. In the yard stands a pink house, next to which are neatly corrugated shacks. Mokoena’s and Mthe’s shacks can be identified by the colours and “Up the Bucs” painted on the sides of their respective structures. Mokoena recalls the last Orlando Pirates versus Kaizer Chiefs game he watched at Orlando Stadium a year ago, from the atmosphere before the game to how he felt afterwards. “Eish, that game! I have never experienced anything like that before in my life. It was packed outside. There was black and white everywhere,” he says, with an overjoyed smile on his face. Before going to watch a game, Mokoena prepares by gathering his regalia. Shaking his body, he describes how he wakes up with the “spirit” for the game. “By the time I leave for the stadium, I am telling you, you will cry. I look good,” he adds. Building the Pirates Park was an idea supported by Mokoena from the moment he knew that the park was dedicated to Orlando Pirates. “My brother put everything together bit by bit. He got some stuff from people in the community and made it happen. When I saw them working with the paint and I saw that it was black and white, I was very happy. But what makes me unhappy is that people come at night and damage what he has made, as you can see it is open to the public and that is not nice. Yes it is attractive, but not like before because people damaged it,” says Mokoena. Just two blocks away from the Pirates Park is a house with “SONO” written boldly on golden plates on the face brick wall. On the window facing the street is the reflection of a faded Orlando Pirates flag. “Ekse bra KK” shouts a man walking past, avoiding stepping on the lawn as the son of soccer legend Eric ‘Scara’ Sono drills more golden plated letters onto the brick wall. Eric ‘Scara’ Sono captained Orlando Pirates in 1957 and used football as a way of disrupting the apartheid system by bringing multiracial players to join Orlando Pirates despite segregation laws. According to the official Orlando Pirates history, players Bernard ‘Dancing Shoes’ Hartze and Mannie ‘Al die Hoekies’ Davids were some of the players that Sono was instrumental in bringing to Orlando Pirates. HERITAGE SITE: Julius Sono keeps the Sono home well maintained with hopes that it will be declared as a heritage site in memory of his father, Eric “Scarra” Sono. 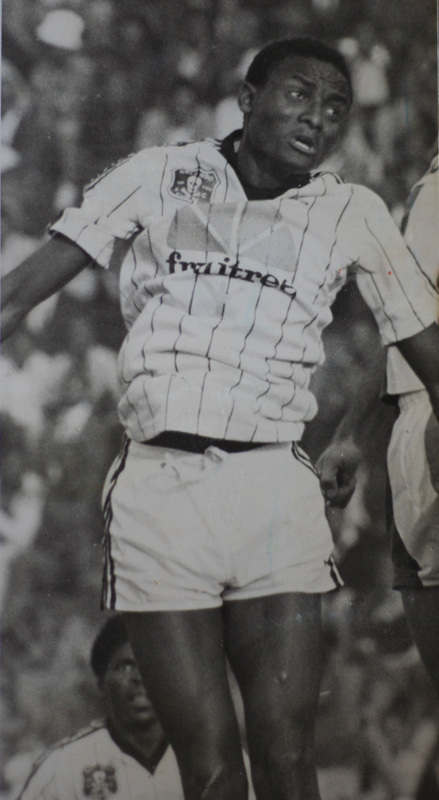 IN ACTION: Julius “KK” Sono playing for Orlando Pirates in 1980. The left-footed soccer player died in a car accident in 1964 leaving a legacy of soccer through his family. His sons, Jomo “Black Prince” Sono and Julius “KK” Sono, continued the family tradition of soccer. The Sono home has been transformed and is managed by Julius as a business park that seeks to uplift and enable soccer talent within the Orlando community. “I am following the tradition of my family of dealing and growing the community through the religion of soccer,” he says. Affectionately known in the community as “KK”, Julius joined Orlando Pirates in the 1980s where he continued to play for five years. 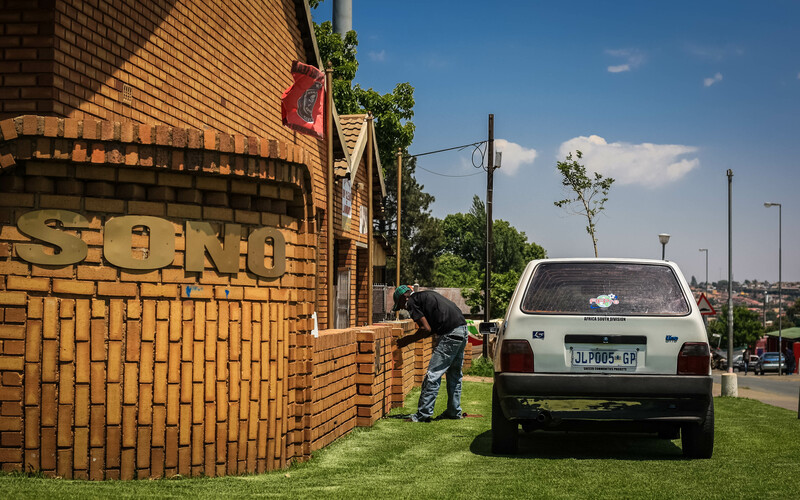 He wears the Orlando Pirates jersey with pride as he walks around the home mowing the lawn and making sure that the Sono name stands firmly on the wall. From his room, Sono brings out a collection of black and white photocopies of his family’s history in soccer. “Soccer was very political at the time my father was playing. I don’t remember much, but he had many friends of different races and the authorities did not like it,” he says. Articles dated between 1963 and 1980 tell a story on their own, mixed with black and white photographs, spread on the glass table in the Sono living room as “KK” describes how fans adored his skills on the field. “The supporters loved me,” says the 53-year-old. “They used to shout at the coach to put me on the field. I was dangerous because I played with feeling,” he adds, as he points at a picture of himself scoring a goal when he played for his brother’s soccer club, Jomo Cosmos in 1986. Born and bred in Orlando East, self-employed soccer enthusiast Sizwe Nkosi sells clothes to support his wife and three-year-old son. Nkosi grew up playing township soccer before playing for the under-19 Orlando Pirates team. He recalls how on his wedding day one of his guests made a joke about how he joined the team. “The speaker told the people at my wedding that he met me at Pirates. He told everyone about how they bought me for R250 and they laughed,” he says, laughing. Nkosi says that he played with Kaizer Chiefs goalkeeper Itumeleng Khune when he was younger, but people always question the truth of this because of his age. He stopped playing soccer professionally when his parents refused for him to lie about his age. “My wife did not believe me when I told her. I showed her some pictures but she still doubted. We bumped into Khune at the mall and we spoke, I could see she believed me then,” he says. Turning his passion for soccer into fandom has given Nkosi the freedom to mentor, coach and host celebratory gatherings at his home. “You know, when you run away from a thing and it follows you, I don’t know if it is passion or what. I still play indoors and train some guys from here,” Nkosi says, as he explains how soccer remains close to his heart. Nkosi believes that “spirit” from both the players and supporters makes an enjoyable match. He keeps this spirit alive by hosting people at his home for post-match braais. “When I coached a team, and we were leading two nil, I called my wife and told her to take R2000 from my money for meat at the butchery. She told my brother to make the fire. We came back to my house to chill and celebrate after we won the game,” he says. 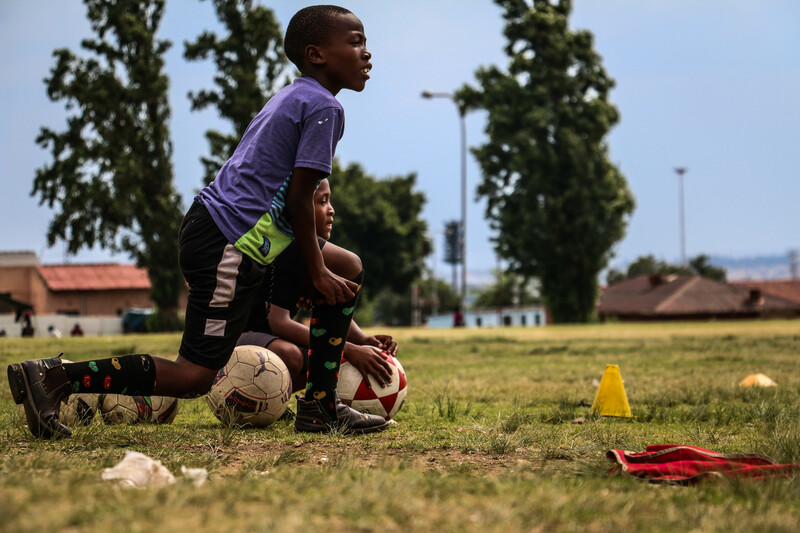 STAY GROUNDED: Soccer helps to keep children in the Orlando East community off the streets and out of trouble. The soccer player at heart remains nostalgic for the days when Jomo Somo entertained supporters with “tricks” on the field. “If you watch the old DVDs of Jomo Sono, you’ll see a big difference. There was no money then, but people enjoyed football and the rules. Jomo used to stand on the ball but if a player was to do it now it is a yellow card,” he says. For Nkosi, local soccer traditions have changed drastically because of the continuous upgrades of soccer rules set by the International Federation of Association Football (FIFA), the international governing body of football. He adds that he does not have anything against international football, but wants the township culture of soccer, particularly in Orlando to be upheld because it is what the fans want and enjoy. “Skill. Our strength is in the skill. Our players are creative. When a team is good with skills, you can tell by the supporters. Orlando stadium used to be full because Jomo Sono was doing his thing. People came because they wanted to see the skill,” Nkosi says. Despite the ever-changing rules of football locally and internationally, die-hard fans like Nkosi still flock in numbers to watch their favourite players battle to win the hearts of the supporters. “All people want to do is enjoy the game. If you tell someone Soweto All Stars is playing at four o’clock, the grounds will be full because people know which players are going to play flair and freestyle,” he says. With hopes to carry the tradition over to his four-year-old son, Nkosi is already grooming him. “I want my boy to play soccer. I guide him. I want him to start at an early age, even now I started telling him not to hold the ball in his hands. I won’t force him to play if he does not want to, but it would make me happy,” he says. 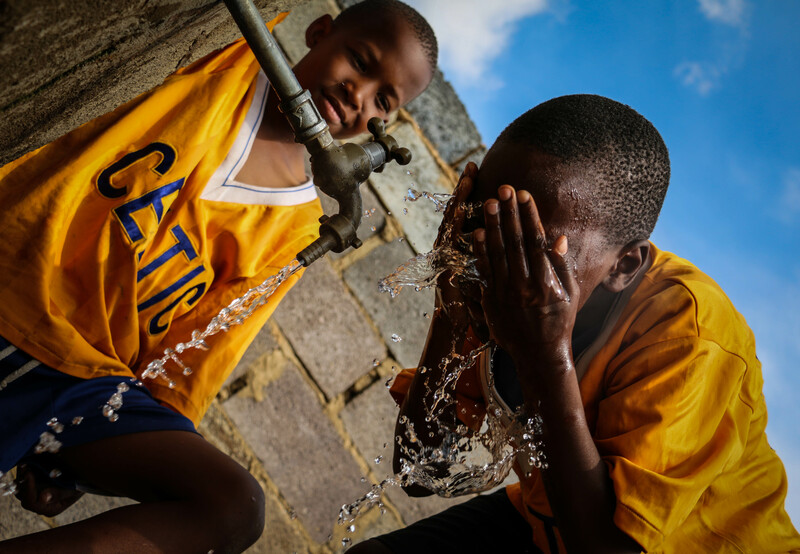 WATER IS LIFE: Orlando Sweepers Football Club players quench their thirst after an intense training session. From giving up your yard in the name of fandom, to opening your home to celebrate with the community and preserve family tradition, soccer in Orlando East goes beyond the 90 minutes on the soccer field for enthusiasts. As it remains a religion in Orlando, the loyal supporters make sacrifices by coming together to share the joy whether it is through providing space for rest after a long walk from the clinic, or an internet café to apply for a job, or just a braai after a soccer match. Giving up something for the love of the game does not take away from supporters, but makes them feel like they belong to a team long after the 90-minute whistle at the end of the match.